Many outdoorsman love preparing game as much as they do hunting it. I am one of them. Moira and I try to seek out new recipes and ideas to give us variety on the dinner table. Perhaps more importantly, I’m always on the lookout for the best snack ideas. I love snacks! 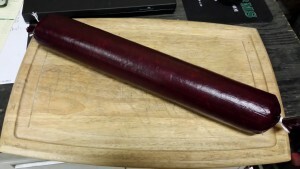 Enter my most recent endeavor, the venison & pork summer sausage. Sliced into thin wafers and served with a spicy hot mustard or wasabi, it will forever change any venison shy family members or friends. As a beginner to making any kind of sausage, I decided to go with a kit that provides the casings, cure and seasonings. After much deliberation I chose the summer sausage/bologna kit in Hunter’s Blend from Hi Mountain Seasonings. This kit is a pretty good value and is relatively simple to prepare. It makes 10 3 lb sausages roughly 2″ in diameter. That’s whopping 30 lbs of delicious. Obviously, we make one at a time! A good electric meat grinder with stuffing capabilities is a BIG plus here. I know some old school folks swear by a quality made hand grinder, and I agree with their points to a degree. But the fact is, when you start feeding the ground meat into the casing, you need to move with a purpose. Starting and stopping too much won’t help to properly fill a big summer sausage casing evenly. The meat needs to stay very cold or it will start clogging the grinder. This is where the speed of an electric unit comes into play. Tips: Do not use metal bowls for the ground meat or mixing. I use a little over 3 lbs of meat because you need 3 lbs IN the casing. The extra gives you wiggle room and enough left over in the stuffing tube and grinder. We pull it out after and make a patty out of it. We started by feeding cubes of venison and pork through the grinder, aiming for a 2:1 ratio. After all the meat was ground, we mix the correct amount of cure and seasonings in the second bowl. Next we sprinkled the ground meat with the mix and added some ice water. Thoroughly mix by hand for a few minutes and you’re ready to get stuffing. Remember, this is where you have to keep moving. That meat needs to stay cold. I push the casing all the way onto the stuffing funnel and hold in place with my left hand. This is a big casing compared to traditional breakfast or sandwich links. You just have to get a feel for how much is filling the casing and use you hand to help move it down while slowly letting the casing off the tube. Fill the hopper with the ground meat and make sure you removed the grinding plate and installed the stuffing plate, if equipped. If not, just use the coarsest grinding plate on hand. Hit the switch and keep that hopper full. DO use an implement to push meat down the hopper chute. DO NOT use your fingers to push it in. You will be tempted to and you will be sorry! Keep working the casing slowly off the stuffing tube as it fills. Use your hand like you were using an icing funnel on a cake and fill in the casing. Don’t worry about the grinder backing up. It will keep pushing harder than you think. If it does back up and stop feeding, use the reverse switch to clear the jam and resume. If this occurs frequently, the meat is too warm. Stick it in the freezer for a few minutes to chill it and resume. When the casing is nearly full, leave about an inch open on the end. Tie this off using string. Don’t worry too much about getting super tight. It’s only job is to keep the meat from coming out, but the mixture is stuffed well and won’t. Plus, you’ll need to slide in a meat thermometer here so you don’t have to puncture the casing. If you have a high speed internal temp sensing doohickey of a thermometer, disregard. And…I’m jealous! Put the sausage in the fridge to cure overnight. When you remove it the next day, bring it to room temperature for an hour or so before cooking or smoking. We cook ours, so I’ll go that route here. Line the bottom rack of the oven in foil to catch any drippings and lay the sausage on the top rack with the thermometer installed. I cook it at 200 deg until the internal temperature reaches 160 deg. This will take about 2 hours or so. When it’s ready, remove from the oven and rest. The casing should be very hot to the touch. After it can be handled, refrigerate overnight. It is ready the next day. We cut ours into thirds. One goes into the fridge for snacking on and two go in the freezer as backups. Serve on a the cutting board in slices with your favorite condiment. As I mentioned earlier, spicy brown mustard and wasabi mustards are my favorites, but a horseradish would serve well here too. Enjoy!